The entire Three-Body Trilogy by Cixin Liu has been out in China for several years already, but we in the U.S. are only just getting to read it. We’re like the people in The Dark Forest waiting around for the Trisolaran fleet to get to Earth- in about 400 years. Ok, maybe I’m exaggerating, but I love this trilogy and want to read it and re-read it three times yesterday. 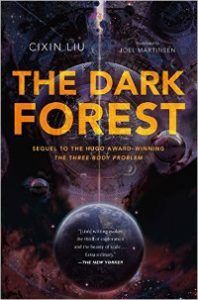 The Dark Forest, translated from Chinese by Joel Martinsen, continues the story of Earth vs. the alien civilization of Trisolaris introduced in The Three-Body Problem. In this second book, Earth has determined that the Trisolarans are indeed on the way- to exterminate humanity and take over the Earth? To negotiate with Earth and live in harmony? No one knows, of course, and so humanity has decided to take advantage of the 400 years that it’ll take for the fleet to reach them to come up with some sort of defensive/offensive strategy. One big problem, though: the Trisolarans have already deployed sophons- subatomic particles that allow the aliens to gain access to all human information- all over the Earth, and have managed to halt technological and scientific innovation. Basically, the Trisolarans have tried to freeze human ingenuity so that when the aliens do arrive, the Earth will be powerless to defend itself. Earth’s only hope, then, lies in the human mind. Sophons can’t access thoughts, and so in a grand plan designed to encourage radical innovation, the Planetary Defense Council announces the “Wallfacer Project.” Four powerful, brilliant men from around the world are chosen to be “Wallfacers” and given nearly unlimited access to resources and information worldwide in order to come up with a plan to confront, if not defeat, the Trisolaran fleet. Framing the narrative is Luo Ji’s understanding of what astrophysicist Ye Wenjie had discussed with him years before: “cosmic sociology.” Its two axioms: “survival is the primary need of civilization” and “civilization continuously grows and expands, but the total matter in the universe remains constant.” What Luo Ji ultimately realizes, amidst all of the panic and planning and human-hibernation and strategic developments, is that humanity must find a way out of the Fermi Paradox (“where are all of the aliens? Are there aliens?”) and figure out how to threaten the alien fleet by using the axioms of cosmic civilization against it. I’ve only sketched a broad outline of The Dark Forest here, because I don’t want to spoil anything (after all, you will be reading it), but it’s these grand, cosmic, philosophical questions about the Earth and its place in the universe that makes the novel so compelling, enough to make me give it five stars. Liu’s discussions of scientific and technological issues, his development of characters who combine strategic thought with noble intentions and dedication, and his wicked-awesome description of the Earth fleet’s first contact with a Trisolaran probe, are just some of the reasons why you’ll never want The Dark Forest to end. It does end, though, but a little too neatly, leaving me to wonder exactly what the third and final book will be about. I have many hypotheses, of course, but…we’ll see.